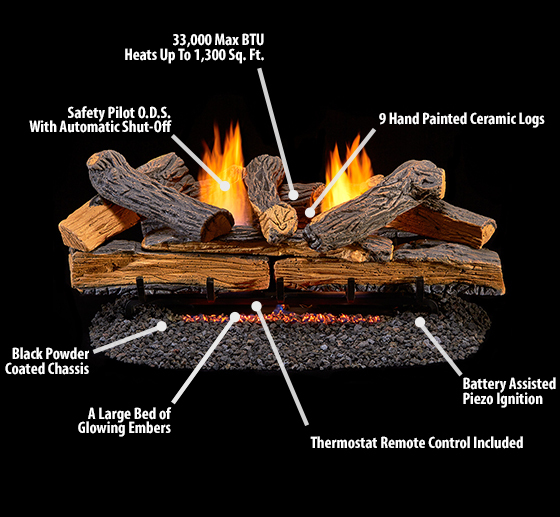 With the Duluth Forge Berkshire Split Oak, you can enjoy a set of quality Vent Free Gas Logs. Get a realistic looking fireplace without the mess of chopping or hauling wood and add that warm elegant touch to your home. The intricate detailing on each of the highly detailed cement logs will bring your hearth to life. Our design team started with real logs to create a log set that gives the feel of a mature fire focusing on the bark, split and charring elements to provide an outstandingly detailed look to create a log set that looks as good without flames in the warmer months as it does when burning. Enjoy the Dual Fuel Technology, Thermostatic Remote Control, 33,000 BTU of heat and the overall savings to your heating bill provided by Vent Free Heating.